When seven-year-old Mahmoud in Jordan was fitted with hearing aids for the first time, he started to giggle. “He could hear and this was really exciting,” says Audra Renyi, Executive Director of World Wide Hearing Foundation International (WWH), the Canadian non-profit that provides accessible services for people with hearing loss in the developing world. World Wide Hearing is gearing up to expand its community-led work into Canada. “It’s about connecting children to their world and giving them the chance of a better life, better opportunities, education-wise but also eventually work-wise,” says Renyi. Founded in 2011, WWH has been training locals to screen for hearing loss, fit low-cost hearing aids, and provide on-going care for the hearing impaired in countries like Jordan, Guatemala, and Vietnam where there is a huge gap in audiology services. The Montreal-based organization focuses on children, as they have the most to gain from early assessment – making them more likely to get an education, find employment, and avoid social isolation that comes from the stigma of hearing loss. 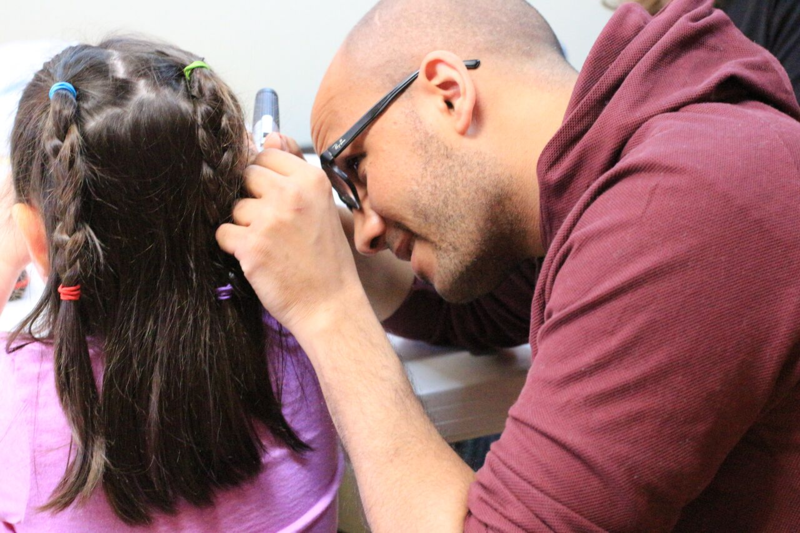 Audiologist Hany Ghonaim checks for ear health at the Step by Step Child and Family Centre (Khanawake, Quebec). On May 2, WWH worked in Canada for the first time, conducting hearing screenings at the Step by Step Child and Family Centre in Kahnawake, a Mohawk community 20 minutes from Montreal. “Difficulty with speech and language development often reflects a hearing problem, so we want to rule that out before we plan our intervention,” says Nancy Rother, Coordinator of Inclusive Programming at Step by Step. For children, inadequate access to audiological services could mean the difference in learning to speak and acquire language. WWH brought with them to Kahnawake their portable diagnostic kits designed by a company called Clearwater Clinical. The app-based audiometer for iPads is a device that sends out tones to a set of noise-canceling headphones. Designed for kids, the app (called ShoeBOX) is set up as a game prompting users to drag and drop icons on the green or red side of the mobile screen. Green means you hear the tone emitted into the headphones, red means you don’t. 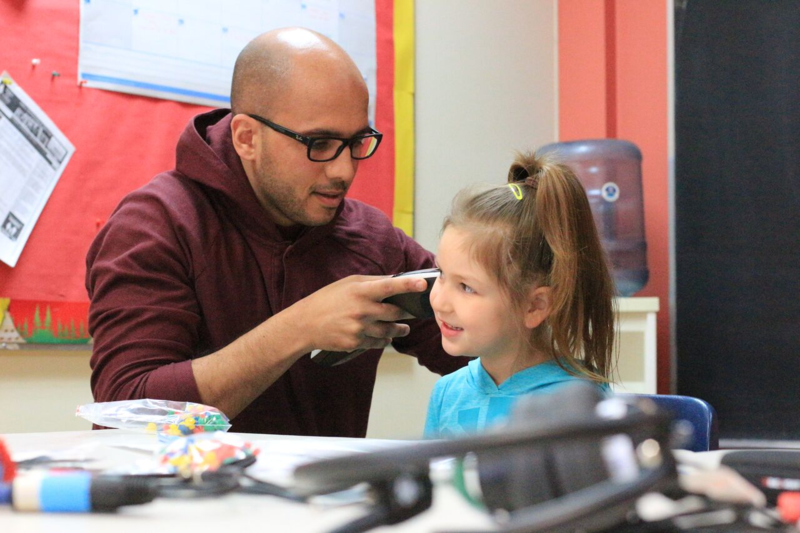 Audiologist Hany Ghonaim checks children’s ears with an otoscope during a WWH screening visit to the Step by Step Child and Family Centre. Twenty-six pre-schoolers were tested in one morning. While a supervising audiologist monitored ear health, the remainder of the team – made up of WWH staff and volunteers who received training on the tool – guided children through the interactive game. Results are used to decide which children need further testing or ear care. To date, a total of 160 children have been screened by WWH over two full days in Kahnawake. WWH also trained six teachers and a local nurse from the community to screen their students, thus building local capacity. “As we’re preparing to get the Northern Hearing Initiative underway, being able to pilot in parallel and being able to work with these communities is giving us a lot of innovation and learning,” says Renyi. According to a study published by Collections Canada (2006), hearing impairment is one of the most common health problems in parts of the Arctic. The article cites prevalence rates of hearing loss in the Inuit school-aged population of up to 30%, compared to the 2.63% of children in the general population. In the Qikiqtani (Baffin Island) region of Nunavut, there’s one audiologist who covers 12 communities that are very far apart. (In Montreal, by contrast, there are 138 audiologists.) When the WWH initiative in Nunavut gets started, 24 health workers (one or two from each Qikiqtani community) will be brought to Iqaluit to learn how to use an otoscope to identify hearing problems and how to use the audiometry toolkit to detect hearing loss. After a mass screening of school children in Iqaluit, the health workers will return to their communities to perform screenings and train other health workers. Renyi explains that while studies indicate high prevalence rates of hearing loss in the North, hard data is missing. Renyi is trying to change that with the support of a grant of $550,000 (US dollars) from Google.org to help develop and test an extremely low-cost mobile toolkit for diagnosing hearing loss and to build the first global hearing loss database. This helps in addressing hearing loss at the local level and also provides valuable insights for global research efforts. 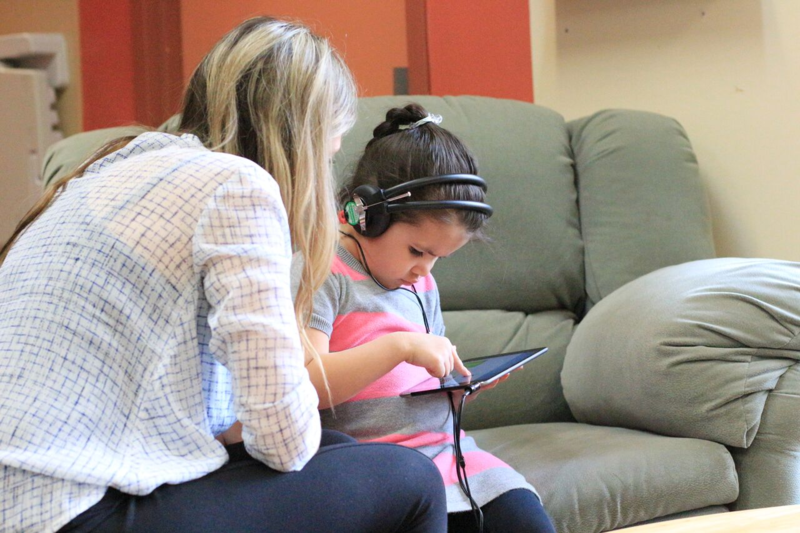 Vanessa Barford from the Montreal Fluency Centre guides a child at the Step by Step Child and Family Centre on how to play an interactive game on a toolkit that tests hearing. Google.org funding helped WWH support the development of an audiometry iPad tool to get data off mobile devices and into the cloud. That work wrapped up December 2015. And that’s only the first step. “Now imagine multiplying that by many devices and by many manufacturers,” says Renyi. The “bigger vision” is to use aggregate data to observe trends. She hopes big data can be used to inform government decisions on resource allocation in order to bring more support for interventions that will help people with hearing loss. “Audra is a pioneer in reverse innovation,” says Peter Singer, CEO of Grand Challenges Canada (GCC). “Her work demonstrates that ideas and innovations that work in low- and middle-income countries — saving and improving lives, reaching rural communities, and making costs affordable – can also be of benefit to Canadians.” Grand Challenges Canada, a Canadian government-funded organization that supports bold ideas with big impact in global health, has been investing in WWH’s work in developing countries, and recently announced a major grant for WWH to scale up its work. Singer stresses that more can be accomplished by working in collaboration. “This partnership is bringing the benefits of innovation back to Canada,” he says. For Renyi, innovation in global health is a necessity: “In resource constrained areas, you’re obliged to be creative. You have to get the cost down while still providing quality care. You have to find mobile solutions to reach underserved populations that live far from hospitals and clinics”. When things work, Renyi says you start to realize that you can apply the same innovative concept in remote Canadian communities facing similar challenges.